Aesop's Fable tells of a shepherd boy who repeatedly tricked the nearby villagers into believing a wolf was about to destroy the flock of sheep, then learned that the tactic often doesn't have a good outcome--- eventually people no longer believe him. No matter what he says. We can fill in the blanks on that outcome. Aesop's Fable parallels a statement by Aristotle where the sage asked what those who tell lies gain by it. The answer was, "When they speak the truth, they are not believed." I don't know if a time will come when this administration and its complicit press will have a need to tell the truth, but should it occur, it may be a tough sell to a good number of the American public. In spite of the "wall of separation" the media has created between what is actually happening in our country and what they want you to believe is happening, people are beginning to awaken and discover "Yes We Can" and "Forward" just may not be the solution for where our country stands today. Yesterday on ABC's "This week," Republican Speaker of the House John Boehner seemingly took a very firm stand to the badgering of George Stephanopoulos. He said "no deal" in capitulating to the bullying of President Obama and the president's refusal to even have a conversation about the so-called government "shut down" and the debt ceiling being raised. And he refuses to even discuss Obamacare, which a growing number of Americans now don't want and can't afford. 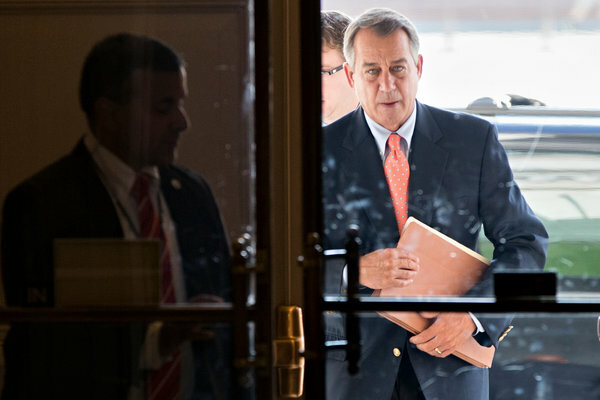 Boehner admitted his present position was not his original position on how to address these issues. May John Boehner skip any midweek nap and remain as awake to the issues and a majority of the American people as he seemed to be yesterday. But Speaker Boehner isn't the only awakening. The attempted exploitation of this chaos is causing many Americans to have their own personal awakening. What does a faux wolf look like? And what response do those who create faux wolves hope for among those whom they fool? To be sure, most believe if our country continues on its present path, we will self destruct. We cannot continue to spend and borrow as we are presently doing. Even President Obama, at one time, understood that we cannot continue to raise the debt ceiling depending on foreign governments to continue to fund us. Only a few years ago he said, "The fact that we are here today to debate raising America's debt limit is a sign of leadership failure. It is a sign that the U.S. Government cannot pay its own bills. It is a sign that we now depend on ongoing financial assistance from foreign countries to finance our government's reckless fiscal policies. Increasing America's debt weakens us domestically and internationally. Leadership means that, 'The Buck Stops Here'. Instead, Washington is shifting the burden of bad choices today onto the backs of our children and grandchildren. America has a debt problem and a failure of leadership. America deserves better." Senator Barack H. Obama, March 2009. But do we deserve to be treated like subjects who can't tell the difference between a real wolf and a fake one? How many times have we heard the phrase "government shut down" in the past 7 days? The New York Times, reporting on Boehner's appearance on ABC yesterday wrote, "Most of government remains shuttered with no end in sight, and markets and businesses are growing increasingly fretful over the chaos that could result..."
That is not true. "Most of government" is not shuttered. In fact, most of it has not been "shuttered" for the past 7 days. We all know that government tried to "shutter" the entrance to the WW II Memorial when a group of 80- and 90 year old veterans came to visit a memorial to their courage and contribution to our freedom. We know the government has spent far more money unsuccessfully trying to keep these heroes out than had it merely let them view their tribute. This morning its being reported the "shuttered" government has added sand bags and some barbed wire to secure the WW II Memorial and other open air war memorials. Here's what we're not hearing so much. On the third day after the so-called shut-down or "shuttering," the Treasury Department issued $106 Billion in new debt. And ironically, the Treasury Department announced that the national debt is $16,699,396,000,000. That's the identical amount they have been reporting since May 17. During the first three days of the "shuttering," the government spent $3 Billion on HUD---the exact same amount spent before the "shuttering." On Friday, the Daily Treasury Statement through Thursday was released. It shows $63 Billion was spent. $26 Billion taxed; $1.6 Billion borrowed; $1 Billion paid in salaries---all that with in the first 3 days of shutting down the government. The Hose has now passed bills that will fund military personnel and a number of other military related expenses. Washington's Governor Inslee was busy last night helping create the wolf. KOMO News said on Facebook, "Federal shutdown hurting Washington --We cannot allow this inexplicable hatred of giving people health insurance to lead us into economic crisis," Inslee said. "That's where we're headed." A make believe wolf says anyone who thinks they have a better way to help people obtain insurance and health care are actually expressing "inexplicable hatred of giving people health insurance." One who creates make-believe wolves shows no restraint. Michael Schaus has written a column published today titled, "The Guy Who Couldn't Stop The Seas From Rising Tries To Close The Ocean." In it he writes, "Assuming the position of 'Supreme Leader' of the US government, President Barack Obama has named a new casualty due to the (partial) shutdown of the Federal Government: The Ocean. Over 1,100 square miles of ocean has been declared off limits to the public in the Florida Bay. Apparently, unknown to most Americans, allowing boats to meander into open water is a cost that has proven to be unsustainable in the event of a government shutdown. Well. . . At least that’s according to the National Park Service. Therefore, it only makes sense that the Federal Government allocate personnel and equipment to enforce the closure of 1,100 square miles of ocean that would otherwise require no maintenance or personnel whatsoever. I mean, do we pay those fish? What expenditure are we curbing by designating guards to keep boats off 1,100 square miles of open water? So just like the WWII memorial, the Vietnam Memorial, and other open-air memorials, the government is expending more resources shutting them off to a taxpaying public (who technically own all those memorials) than if they were to simply leave them alone. But, it gets worse: Even Catholic Priests are facing arrest if they dare volunteer at army bases for Sunday service. Why? Maybe because the Federal government has decided it must inflict more pain on our men and women in uniform during the shutdown. Maybe the Chaplains and priests should hold their Sunday service on the greens of Andrews Air-Force Golf Course. After all, that’s still open. He concludes: "The President’s temper-tantrum-governing, however, trudges on as he closes the oceans, bullies veterans, and violates the 1st amendment of military personnel. The most audacious part of his childish tantrum, however, is his insistence that only absolute compliance with his demands will rescue us from the pain imposed by his decisions." What response do those who create faux wolves hope for? Certainly compliance. But mostly they hope to create fear. And most fear is a false fear, but all fear is a controlling emotion. I'm talking more about how fear drives our lives and our decisions on the radio this morning. Join me live at 9 AM PDT. Here's how to listen in from anywhere in the world. Be Vigilant. Be Informed. Be Bold. Be Discerning. Be Prayerful. Be Blessed. Obama is handling this correctly. You don't negotiate with hostage takers or it will just get worse each time. If we allow the republicans to get away with this, next time it'll be medicare or social security or any other program they don't like. This is not the proper way to change laws and it certainly doesn't reflect the will of the people. Gary, I believe that there is a biblical explanation for people "choosing to believe the lies" and it is in Romans... and it has to do with the explosion of homosexuality (marriage, hate crimes, etc)... I truly believe there is a strong connection in our society. Years ago, Barbara Walters interviews the president of the ASJA | The American Society of Journalists and Authors, an "open" homosexual. She asked him if there were a lot of homosexuals in the journalism profession, and he responded, "You'd be surprised how many of us there are." If you havn´t read "The Marketing of Evil", you should. The Natational Association of Retired Federal Employees (NARFE) at narfe.org reported that 800,000 employees have been furloughed. This web page provides useful information on the impact of the shutdown to Federal employees and the services they perform. You may want to comment on this. Why is the credit given to Senator Barak Obama in March 2009 when he took office as President in January 2009? As I said, if we give in to the republicans on this new tactic, there'll be no end to it and even programs like social security will be at their mercy every year or two. If you don't like a law, change it through the traditional means, not this new hostage vehicle. America realizes this and these stunts will likely cost republicans the house in 2014 (yay! ).